Grey County’s highlands holds many surprises among them waterfalls, pretty villages and spectacular valleys. Rocky prominences share the landscape with secluded glens and fast moving streams and rivers, eager to complete their journey to the lake. From Epping Lookout, Beaver Valley lies below with gorgeous vistas of bottom lands orchards and farm fields folding to the horizon. The Bruce Trail that traverses the Niagara Escarpment runs through the highlands. Seven spectacular waterfalls drop from the escarpment’s high limestone ridge to verdant valleys and lowlands that stretch to Lake Huron and Georgian Bay. Eugenia Falls has a spectacular plunge into Cuckoo Valley while Indian Falls, at the edge of Owen Sound is horseshoe- shaped and surrounded by forest. Inglis Falls on the Sydenham River has a spectacular drop to the valley as has Jones Falls. McGowan Falls are set in a cedar copse in Durham Conservation Area. Walter’s Falls is one of the prettiest and close to Flesherton as is Hoggs Falls on the Boyne River. The village of Flesherton, tucked into some of the finest farm land in Grey County, is a pleasant surprise as the community is one of the most unpretentious yet charming in Grey County. Village history dates back to the mid-nineteenth century when free Africans and immigrants from the British Isles settled the area where two important trails crossed, the Toronto to Sydenham and Durham to Collingwood routes. The community boasts some fine examples of Ontario vernacular architecture. Most notable are a number of nineteenth century buildings along main streets. One of the oldest, an impressive red brick structure in the middle of the village, was built as an inn and still houses, among other things, a unique bed & breakfast and restaurant. Murals that depict the area’s automotive history through scenes of gas stations c1920's through c1950's bolster the theme of Flesherton’s crossroads and agricultural history. This theme is also celebrated every year at the end of September with the Split Rail Festival, named for the ambiguous wood fences that snaked across Ontario’s landscape. For more than twenty-nine years, the community has opened its door to hundreds of visitors who come to enjoy a weekend of family activities. The Split Rail Festival is a salute to the hearty folks who pioneered the area. It is held for the sake of preserving their heritage and history and as such, is one of the friendliest community events in Ontario. Attending the festival is akin to being at one large street party where local folks go out of their way to make strangers feel welcome to their weekend of fun. To find out exactly what takes place and where, be sure to get a schedule of events, available at the gate or by writing the festival headquarters. Most activities take place at the festival grounds and Grey Highlands Secondary School, both at the south edge of the village. Satellite events are held at the Canadian Legion, Masonic Hall, South Grey Museum and South East Grey Support Services Building, all conveniently located in the small community. A horse drawn waggon takes visitors from the festival site to the downtown area. Saturday morning begins with a Pancake & Sausage Breakfast at the Legion on Elizabeth Street. This popular chow-down starts at 8:00 a.m. The Legion also serves sausage on a bun on Saturday at lunch time. 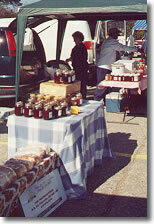 The Farmer’s Market, set up in the parking lot at Grey Highlands Secondary School, begins 8:00 a.m. Tables are laden with baked goods, preserves, fresh fruits and vegetables, flowers and handicrafts all produced by local people. Gates to the festival proper open at 10:00 a.m. and there’s usually a line-up to get in. The grounds include Heritage Field, Entertainment Pavilion, Arena, Kimplex Community Hall, Children’s activities area and a number of food booths that serve up local fare. Admission is reasonable and all proceeds go toward community projects. Those people interested in handmade quilts, head for the Kimplex Community Hall where a large number are attractively displayed prior to an auction that takes place at 1:00 p.m. Those interested in taking part in the auction, should sign up for a number and pair of disposable gloves so that quilts can be more closely. Quilts are so beautifully made that it would be difficult to choose one to bid on. As a number of quilts are raffled, don’t forget to purchase tickets for the opportunity to win one of these beauties. 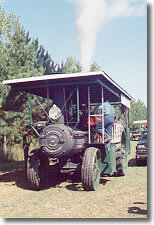 Exhibitions and demonstrations of farm machinery and equipment are continuous on both Saturday and Sunday at Heritage Field. Antique tractors and other machinery are lined up for inspection. 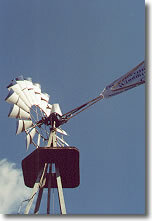 A working windmill attracts young and old as does the massive steam engine that belongs to Grey County Museum. Owners are proud of their antiques so there’s always someone to talk to about tractors and old farm equipment. Take the time to stop and chat. 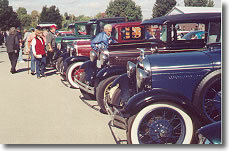 Antique and classic cars are on display in front of the arena, an appropriate event given the importance of Flesherton’s crossroads history. 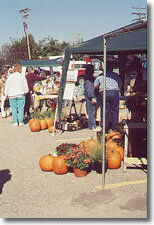 The arena is chock-a-block full of vendors selling art, crafts, unique gifts, clothing and specialty foods. Children are not left out at this festival. Child-oriented activities include pony rides, mini-golf and tractor pull, pumpkin carving and make & take crafts. A special children’s draw takes place on Saturday while Sunday’s activities include old fashioned games and contests such as the sack and three-legged race. The on-site Pavilion offers continuous entertainment with more than thirty groups and individuals scheduled over two days. As Flesherton has its roots in the rural tradition, on-stage entertainments include clog, step and square dancing, fiddlers, community orchestras and old tyme dance music groups. This Pavilion is the site for the official opening at 10:30 a.m. on Saturday and for a Community Praise Service beginning 12:30 p.m. on Sunday. While teens enjoy a concert in the Pavilion at 4:00 p.m. on Saturday, those in the know scoot across to Grey Highland Secondary School for the Old Tyme Fowl Supper with Tom turkey and lots of savory stuffing for the main course and delicious pie for dessert. The supper is served continuously from 4:00 to 7:00 p.m. Go early! If you don’t like turkey, opt for the Rib Dinner that is served from 11:00 a.m. - 7:00 p.m. at the opposite end of the village in the SEG Support Building. Flesherton is a quanti-essential Ontario village with an interesting main street. Shops include a good hardware store, art gallery, antiques and book shops, café, restaurants, grocery store and several gift shops. You can’t get lost so park your vehicle, take the waggon and walk around tree lined streets with names like Spring, Campbell, Margaret, Elizabeth and Levitta. South Grey Museum is located in the heart of the village, in Memorial Park. Among its artifacts is a dress worn by Agnes Campbell Macphail, Canada’s first woman member of Parliament, when she was presented to the late King George V1. Should you be interested in gospel music, a concert is held at the High School on Friday evening as part of Festival activities. You can also have an early peek at the quilts on Friday evening. As accommodation is at a premium in Flesherton, make reservations well in advance. Most visitors opt to stay in Collingwood or Owen Sound, both a short drive from Flesherton. Many people plan a full weekend in the Highlands. They spend one day at the festival and a second touring the back roads of the County, enjoying the ambience of other small communities and the beauty of those magnificent waterfalls and verdant valleys.